← It’s all Swings and Roundabouts. Katy is a BIG hit in this house. I’m actually quite fond of this particular kids programme, for a start they actually cook real food rather than a series of ever odder food art/sculpture and I’ve also really seen the benefits of the way they help the children perform tasks by describing the kind of movement they need to do. 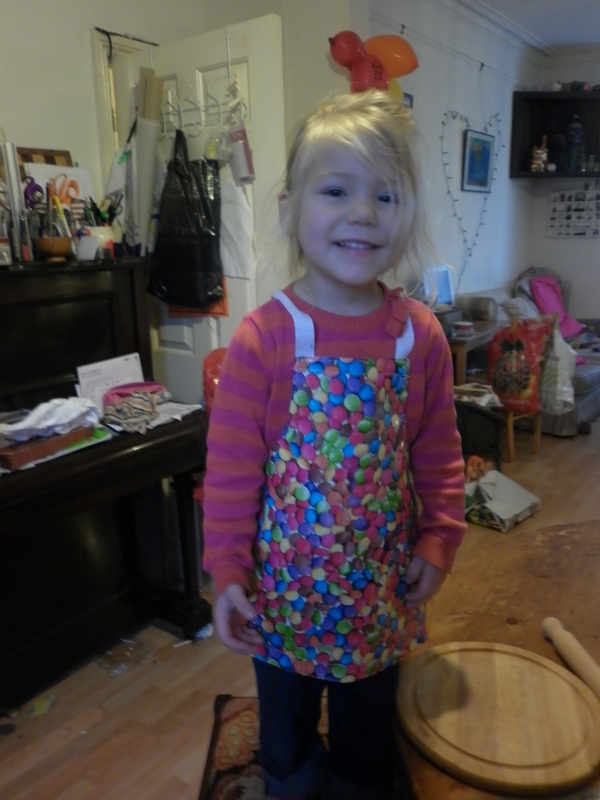 Parroty pinchy fingers and grr-y claw hands have helped with the frustrating preschool tasks of button doing up, green pepper ripping and egg cracking in this house. Anyway these were inspired by a recent episode. 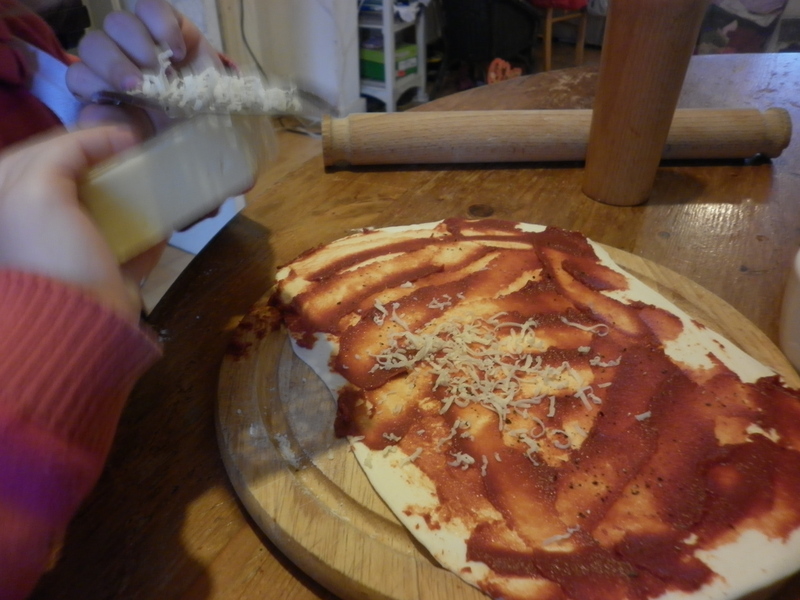 We also assembled; flour for dusting, tomato purée, cheese, basil and black pepper. We added to the basic recipe; olive oil, paprika, fruit vinegar and the scrapings of old tapenade in the bottom of the jar. 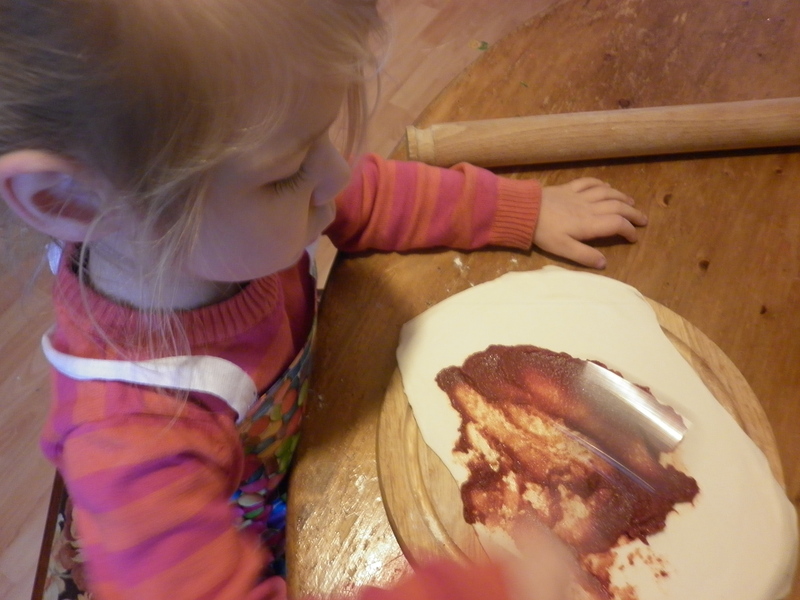 Then squeeze tomato purée onto the surface – making a smily face with it is purely optional. Then I swerved from the recipe adding some paprika, a dash of sweet vinegar (I use one from a local shop which is vinegar mixed with fig must but any will do including balsamic) and a drop of olive oil and a smear of tapenade. (None of this is essential..) Then mix it all together with the back of a spoon and spread it out over the pastry. A bit of pepper – and what kind of face? She’s having a lovely time people, really. This is a good bit.. pick and rip basil leaves, strewing them artistically over your rectangle. The basil is sadly not homegrown, I just can’t keep them going over the winter. My mum manages it on her windowsills but she has virulently green thumbs and house that doesn’t reach my dank and mould levels. It’s 60p supermarket pot of basil which did the job admirably then ended its short stalky life enlivening a pot of soup. Now for the tricky bit, rolling it up. 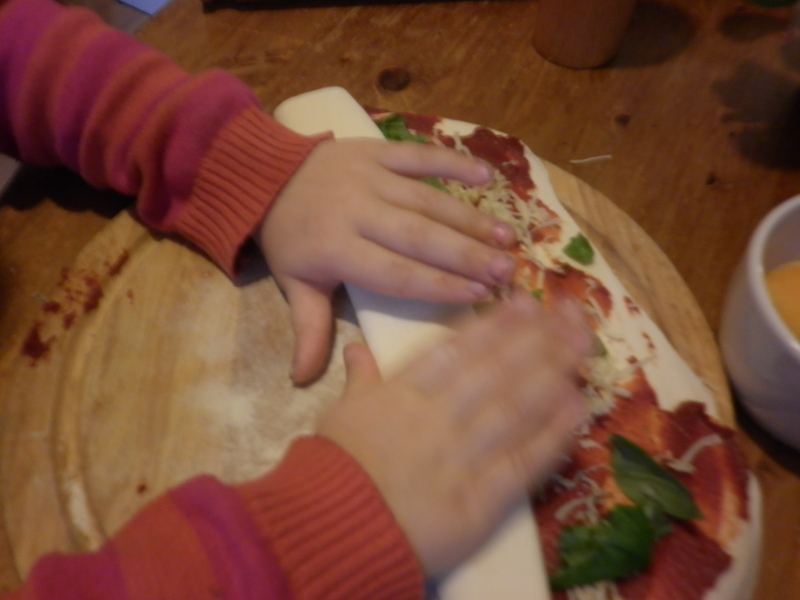 Not the easiest tasks for small hands but she managed it. The idea of doing the same thing side by side is I will resist the temptation to lean over and do harder bits for her and she can watch my hands and copy. It’s a technique that works well in coaching with children and I’d recommend it. This was the hardest bit to keep my hands to myself in though. 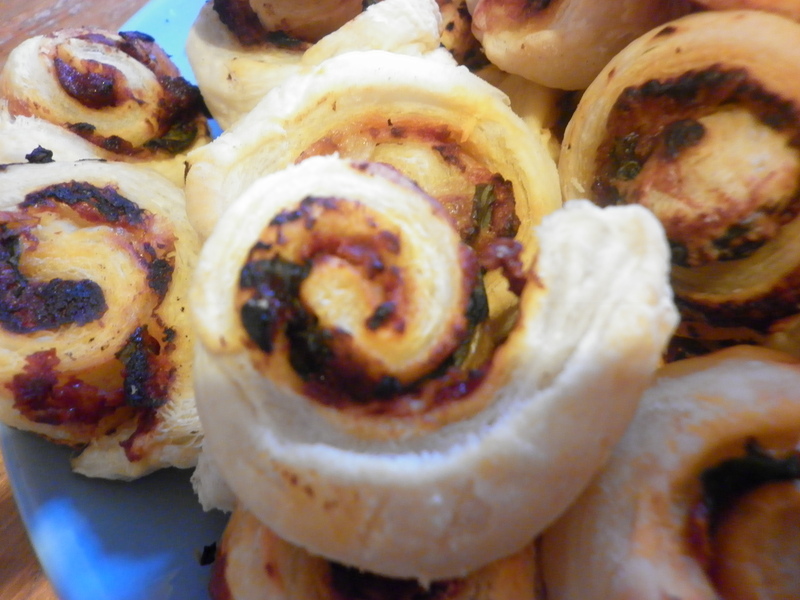 Or maybe this bit, the chopping up… Still the roll is quite robust though they benefit from a small reshaping squeeze as you place them, spiral up, on a baking sheet. 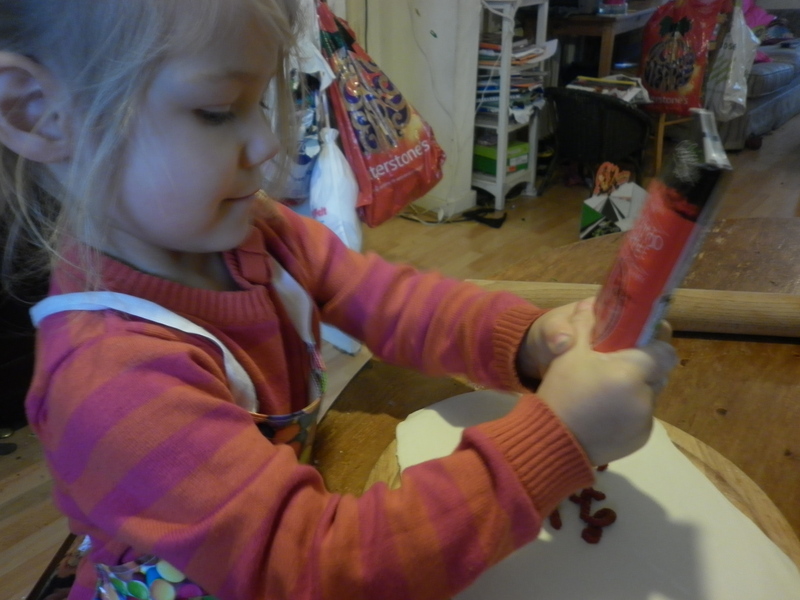 Ida managed perfectly well with her small knife and we talked about the saw-saw-saw movement she needed to use and why she needed to be careful with her fingers. Then into the oven for about 15 minutes baking and… Ta Daaaa!!! They taste great and have worked brilliantly kept in a airtight box and reheating a couple at a time for snacks. Zeph’s had them in his sandwich box as well. 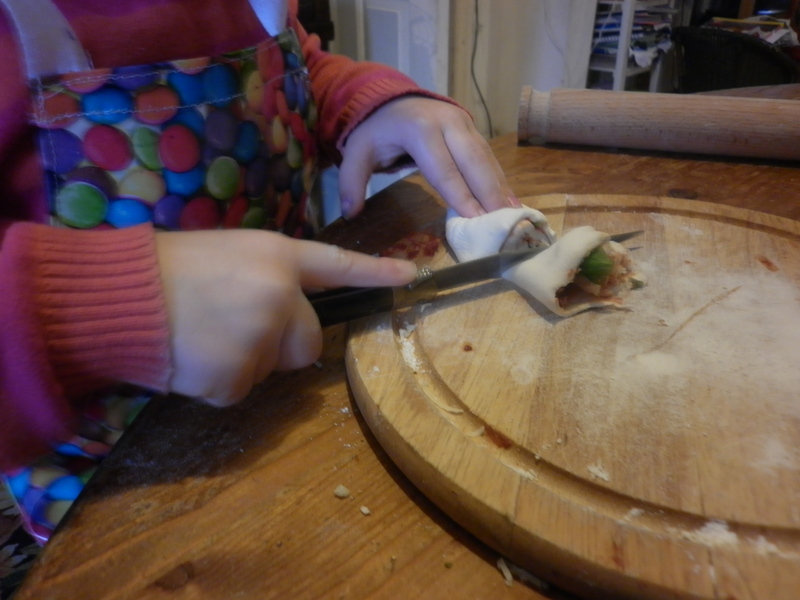 I’m not going to bore you with the sausage rolls but we grated two apples in with the sausagemeat which was a resounding, scrumptious success. I’m always going to do it from now on. 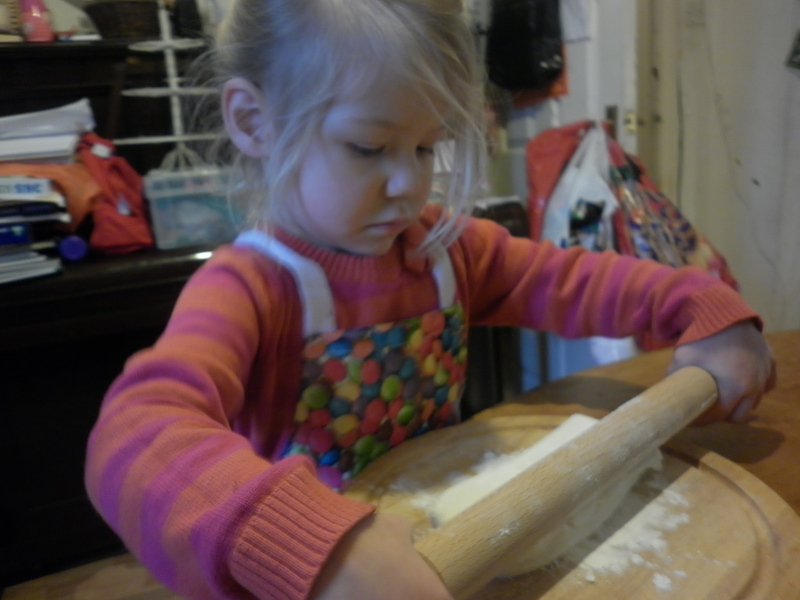 And on that bombshell revelation I shall leave you, wiser in the wisdom of leaving small people alone with beaten egg and with a small daughter who has expanded her knife skill repertoire. 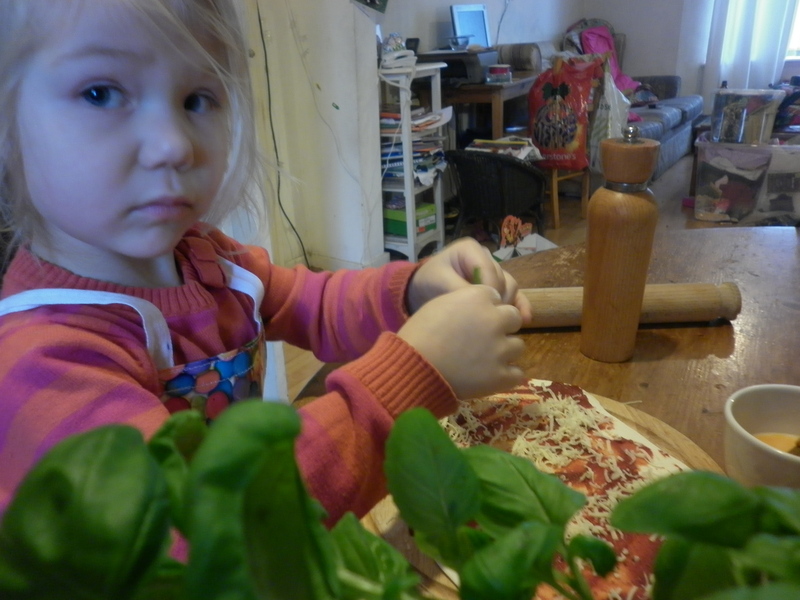 This entry was posted in recipes, Uncategorized and tagged children, cooking, cooking with children, food, parenting, recipe, toddlers, Tomato and cheese pinwheels. Bookmark the permalink. 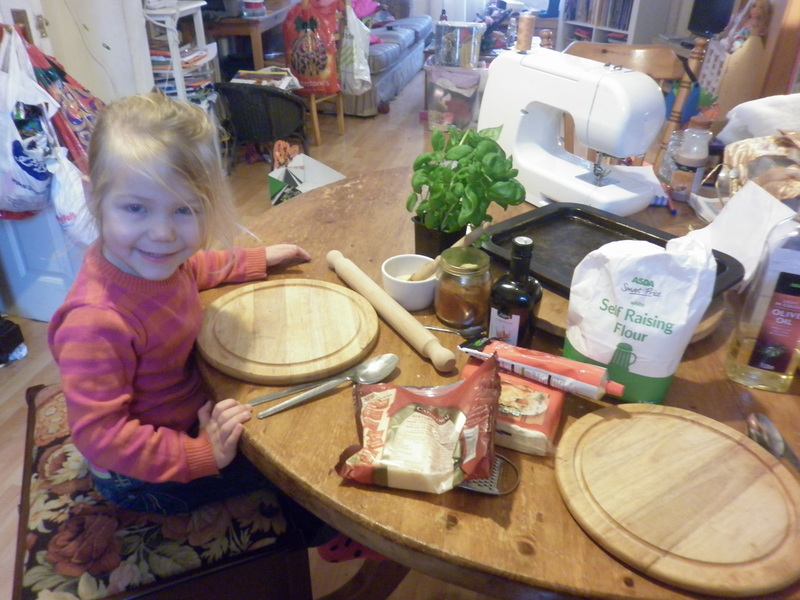 Ah, she’s a charmer (helps her get away with the egg wash capers) — and you are a patient Mum. Thanks for sharing the photos of the process. 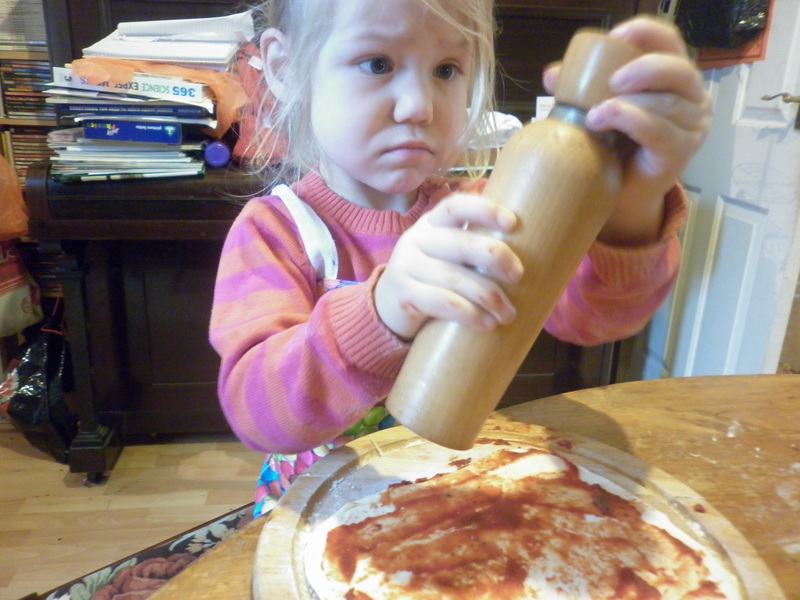 I love your pictures of Ida cooking. You’re going to have such a wonderful selection of photos to look back on when she’s older. Ha! I know! I’m busy stealing moments to fill an order… it’s easier if it never goes away so we do everything around it. Thank you so much about the butterflies – cheered me hugely on a miserable day 🙂 I will do!